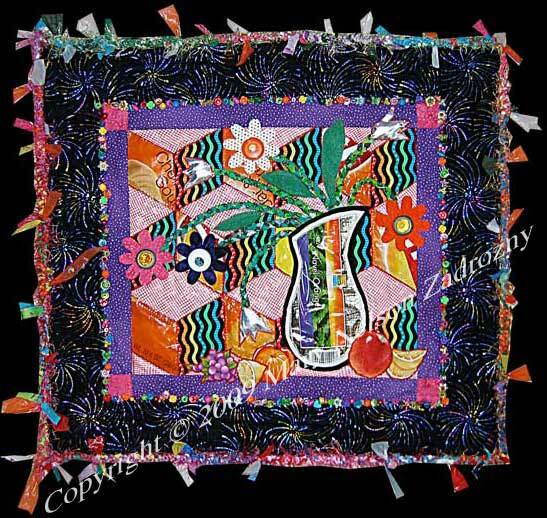 Title: "Orange U Glad We Recycle"
Quilt Description: Created with materials usually sent to the landfill in an effort to reduce my impact on the planet. 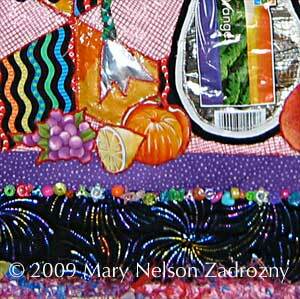 It was very challenging working with some of these items; can't iron seams, the chip bags can tear when quilting. It is sometimes like learning to quilt all over again, but exciting to develop new techniques & try out new materials. The outer edge was created by knitting together plastic bags, yarn and fabric. Materials: Cotton fabrics, potato chip bag, mesh bag that oranges came in, embellished with bottle caps, beads, jewelry findings, plastic trash bags, and green foam packing material. Techniques: Machine Pieced, Machine Appliqued, Hand-Quilted, Knitted Trim, Braided Flower Stems.